An international study led by Monash scientists has found that Tasmania was likely to have been originally ‘attached’ to the western United States. The finding is outlined in a study published in Geology. Lead study author, Dr Jack Mulder, a research fellow in the School of Earth, Atmosphere and Environment said geologists wanted understand the position of Tasmania within the supercontinent Rodinia by studying the ancient rocks that form the rugged mountains and coastlines of western Tasmania. One billion years ago, most of the Earth’s continents were joined together into a single landmass— the ‘supercontinent’ Rodinia. Around 700 million years ago, the Rodinia supercontinent began to break apart and eventually fragmented into a number of smaller continents, which scattered across the globe. “Geologists can piece the supercontinent back together by matching up similar-looking rocks that formed during the time of Rodinia—like the pieces of a giant puzzle,” Dr Mulder said. “Our research aimed to understand the position of Tasmania within the supercontinent Rodinia by studying the ancient rocks that formed the rugged mountains and coastlines of western Tasmania,” he said. The researchers were able to trace where the ancient sand and mud came from by analysing the geochemical fingerprint of tiny grains of the mineral zircon, which makes up a small proportion of the sedimentary rocks. When they compared the Tasmanian rocks to similar-aged rocks nearby in Australia, they found that not only did they look very different, but they also had distinct zircon fingerprints. “The enigmatic Tasmanian rocks look strikingly similar to the one-billion-year-old sedimentary rocks found near the bottom of the Grand Canyon in Arizona,” Dr Mulder said. “In addition to forming at the same time and in a similar geological environment, the ancient sedimentary rocks in Tasmania and the Grand Canyon share the same zircon fingerprint. “Together, this evidence supports the interpretation that these now widely separated rock units once formed part of the same sedimentary basin. Dr Mulder said the study was important because researchers were able to show that Tasmania, together with a series of small and similarly enigmatic continental fragments that were now exposed in Antarctica and submerged beneath the ocean south of Tasmania, provided key geological links between the larger continents of Australia, Antarctica, and the US. 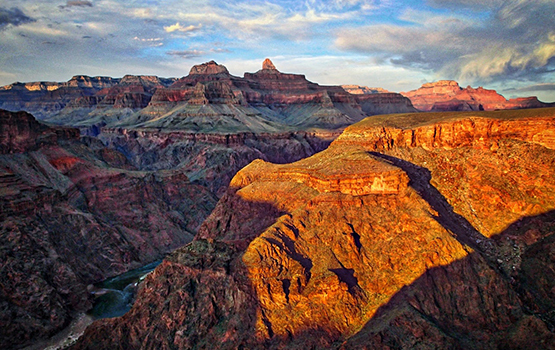 The study involved field work in western Tasmania and the Grand Canyon, Arizona. Researchers examined the different layers in sedimentary rocks to understand their composition and the type of environments they formed in. They then analysed sand-sized grains of the mineral zircon, which make up a small proportion of the sedimentary rocks. These zircons are eroded from even older rocks and are transported in rivers before being deposited in the layers of mud and sand that make up the sedimentary rock. “We can determine the age of these zircons (through the radioactive decay of tiny amounts of Uranium found in the minerals) and analyse their chemistry, which together provides a ‘fingerprint’ of the older source rocks in which they originally formed,” Dr Mulder said.